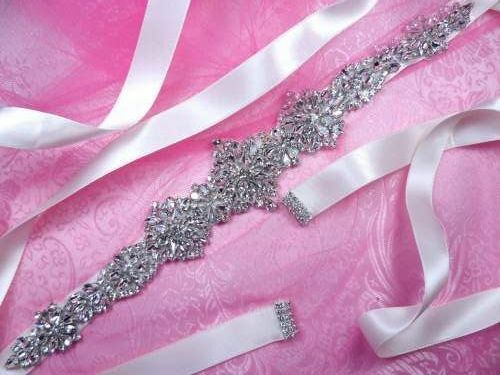 Catalog > JB232 Bridal Sash Silver Crystal Clear Glass Rhinestone White Ribbon 13.75"
This bridal sash sits on White double faced satin ribbon that measures 118" x 3/4"
The ends are accented with rhinestones. Limitless projects can be made to sparkle with this high quality glass rhinestone treasure, so order one or more and be inspired, whether it’s your big day or just another afternoon with your little princess. A beautiful Bridal Gown Sash!